BOMOSEEN—State officials recently discovered the presence of an invasive clam species in Lake Bomoseen, according to a news release Tuesday, Aug. 30. The Asian clam has been documented in surrounding regions like Lake George, N.Y., but has not been found in Vermont until now. Asian clams, like zebra mussels, are filter feeding organisms that can deplete resources needed by native species and increase algae blooms. They can also form dense populations very quickly, clogging intake pipes to lakeside homes, industrial water systems, and irrigation canals. 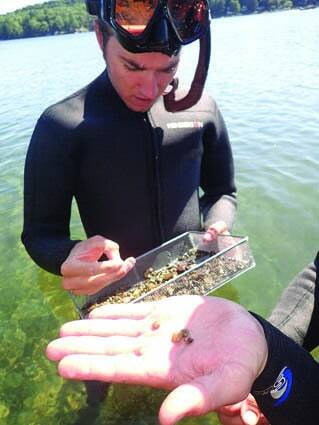 A summer natural resources instructor at the Vermont Fish & Wildlife’s conservation camp on Lake Bomoseen identified the Asian clam during work one day and reported the finding to staff biologists. Once positively identified, the Agency of Natural Resources then surveyed the lake to determine the extent of the population, focusing on areas with suitable habitat and likely introduction points such as boat ramps, public beaches, and the docks near the Conservation Camp. Survey results showed the clam population limited to an isolated area in the southwestern part of the lake. The area in which the species was confirmed measures approximately 14 acres, with water depths up to eight feet. No Asian clams were found at any of the other public access areas or beaches surveyed outside this area. It is unclear how or when the species was introduced to Lake Bomoseen, or exactly where the initial introduction occurred. Agency scientists say the presence of large, adult clams (up to 2.4 centimeters in diameter) and the relatively high density of clams in the affected area indicate that the clams have likely been in the lake for a year or more. Like most aquatic invaders, Asian clams can be transported from one body of water to another via small amounts of water or sediment. Boaters, anglers, and other lake users should always clean, drain, and dry their equipment after use to ensure that unwanted hitchhikers, like Asian clams, are not spread to new waterbodies. The Asian clam is native to the eastern Mediterranean and other temperate regions of Asia. The species has spread throughout much of the eastern U.S., and several populations have recently popped up in western states as well. A diver finds Asian clams recently in Bomoseen, Vt.